Here is some feedback from our members that participated in this year's shows. Hope you enjoy their inputs! Salmon Falls Keona and I were recently told, because we were winners in the 2006 Traditional Cat pet show, that you were going to send us a box filled with surprises. We were so excited when the Fed Ex delivery truck came today with that special box for us. 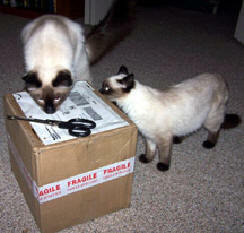 As soon as our humans brought the box into the house, we began to attempt to bite it open. But it was so well wrapped, we could not break through the plastic. We chewed, we sniffed, we tried our best…but, anxious as we were, we had to wait for our humans to bring out the scissors and open the box for us. We tried to be patient, but it was really hard. Now that they have finally opened the box, we are so happy. Everything is down on the floor where we can see it. We are overwhelmed by all of the things you have sent to us. We feel so loved. I mean—Wow! Look at all the yarn ribbons we have! I tried to walk around and count them, but there was so many I kept losing my place. After losing count several times, I was about to give up. Then, Salmon Falls Keona suggested that it might be easier to simply sniff for quality instead of count for quantity, as math is not our strong subject. So, I sniffed very carefully and eventually decided that the blue yarn ribbons smell the best, because they are first place and they match our eyes. However, I must admit it was a hard decision to make. All of the ribbons are very nice! Of course, Salmon Falls Keona loved the gold ribbon the best. In fact, he was so impressed by the gold that he took it to the corner of the room so he could enjoy it quietly with no interruptions. Winning first place in his class has been quite an experience for him, and (as you can see by the photo) he is taking his new position very seriously. As for me, I’m just resting in the glory of it all. Everything you sent is just great—and I’m feeling like a first class Diva, sitting underneath my yarn ribbons and chewing on the gold—I couldn’t be happier. I’m sitting on top of my world! I just got the package in the mail, and I LOVE it!!!!! What great ideas for prizes! I certainly didn't expect to be included just for judging! So thanks, that was very thoughtful! I had a great time judging, and would certainly do it again in the future, though I think next year I will be entering the show as I have a number of outstanding cats that I think will knock the socks off of next year's judges! They deserve some recognition! But after that I would love to be a judge again! surgery. Thanks for the prizes! They should keep the cats busy for awhile. Well imagine my surprise when I opened my fed -x box and found all those great goodies for me and my kitties! Thank You Diana, I very much appreciate the lovely gifts and the practical ones too. I would be happy to judge again! 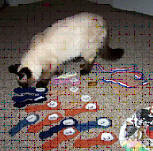 Dear Traditional Cat Association, Inc.
How exciting it was to receive the box filled with gifts for Beauregard (OH! YES! And for me too). He loved the toys, especially the Pipe Cleaner Spider. 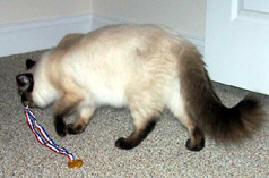 This toy gets carried all over the house--up and down stairs, put in bed and finally you may find him by the food bowl. 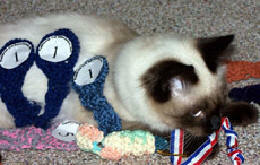 This was the first time Beau had been entered in the TCA Cat Show. How proud my late husband would have been of his lettle (? ?14 Lbs) boy winning FIRST PLACE. Me too, as he's truly a joy to every one. Folks who don't even like cats love him. Everybody at the Vets wants to carry him around and give him hugs. Beau thrives on all the attention! Beau is now 14 years old, is healthy and I hope he can be with me many more year. Thank again for everything to TCA and all the show donors. Mrs. Jimmie T.
I got my Zoey's gifts today, I want to say the spiders made out of pipe cleaners was great, my cats always takes my sons from his room. They love them!!! Thank you and we cant wait until next years contest. 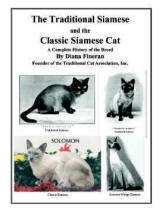 I'm very proud of my cats and this contest makes us cat owners feel even prouder!! I wanted to thank you for our “goodie” boxes. Thank you , and as I’m sure you can guess, all the toys are all over the house being thoroughly enjoyed by four furry friends. Fran’s trophy is on the shelf with my other “cattery” stuff, pix of the cats, all the certificates, etc. I guess I had thought that Fran’s trophy was to go to a cat, I don’t know why I thought that, but imagine my surprise when I opened the box with that in it? Thank you so much, but I don’t feel that I deserve it in any way. YOU and John should have it every year for all of your hard work, both financially and every other way possible. You both do so much for the TCA and nobody does anything for you----me included! A terrible thing to admit too. You and John are doing a fine job. You should both be proud. I received the box with the crocheted goodies in it. Thank you for spending the time to do that. 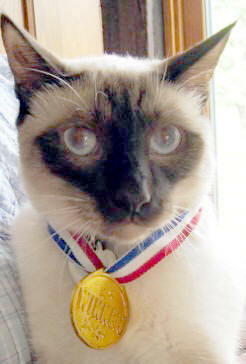 I just want to send you a thank you for all the nice things you sent me for the cat show winnings. The kitties love the toys ! ! I look forward to next years. I'm already taking photo's ! !